Many of us remember the claims of Handwriting Recognition on the Newton. The device was incredible in so many other ways but the HWR was not as far along as it needed to be for people to accept it as a way to work with a hand held device. With the iPad, Apple isn’t about to risk claiming they can handle your handwriting to text conversions since everyone writes completely differently and it’s a headache to support. Instead, it is left to aftermarket app providers to fill the needs to take our handwritten notes to print text. One of the better known, and more successful in getting our handwriting right is WritePad. 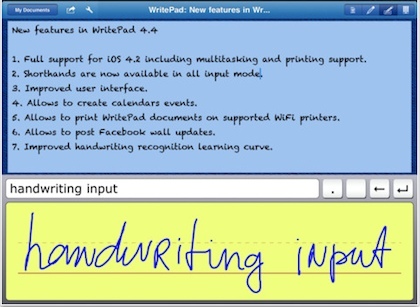 The developer offers a series of apps in the area of handwriting and shape drawing conversions, this one is specializing in handwritten notes only. It supports folders and cloud storage/sharing so it covers the news of the general note taking in everyday life. Some folks in the office have handwriting that any app has issues with, so your writing style will impact your successful translation to text. 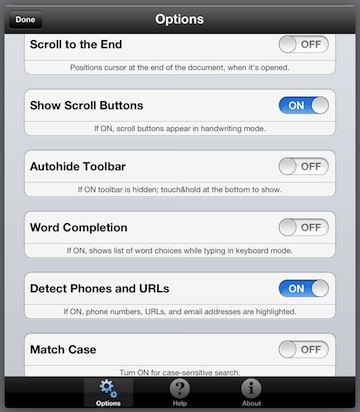 Handwriting is the best, then printing in small letters is next in an apps ability to give you typed text back. Printing in all caps is very hard for an app to pick apart how the individual lines work together to make a letter. 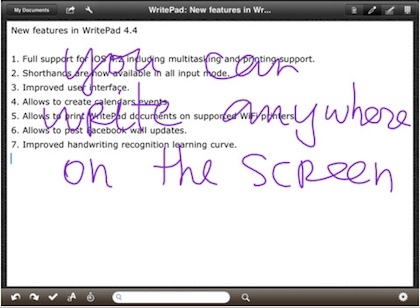 With WritePad, you can write on the full page canvas or in a smaller text box along the bottom of the page. While the box across the bottom of the screen is less like writing on a piece of paper, it does encourage some level of control when writing so the recognition engine has less decisions to make. An on-screen typewriter keyboard is also available. From the gear ‘Settings’ icon in the lower right corner, there are several screens of options to scroll through and set to better match what you need the WritePad app to do for you. The most successful users of the app in our group are constantly playing with these adjustments. These are best to play with a bit and not be afraid to tune as-you-go. With a little work over time, tuning these settings can get the app to better match how you think about writing rather than the other way around. As you write, the Tools pulldown within WritePad offer a few use-as-you-go tools to help get text onto the page. 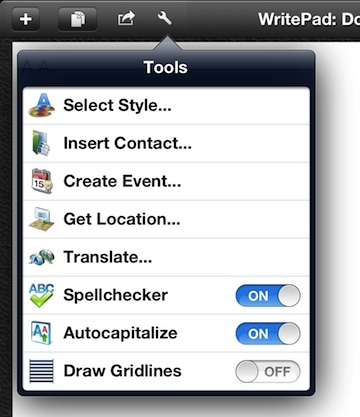 Font, auto insert a contact, insert a location, create an event with the text you’ve entered, auto capitalization for sentence starts, and spell check as-you-write are a few features to make your handwritten notes created quicker. 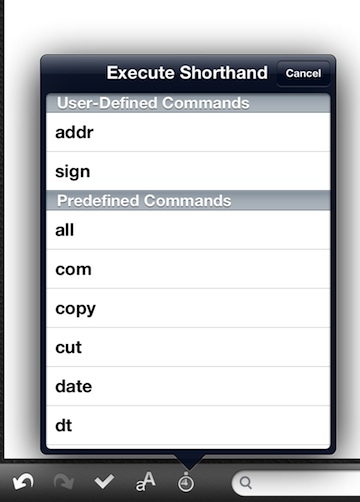 A feature many people miss in WritePad is the use of shorthand letters. Rather than always writing full words, a few letters will result in an action or creation of words. While it means your having to remember a few shorthand groups of letters, it also means less to write and a better chance of correct text appearing in your final document.